Federal Aid Comprised Record Part Of Americans' 2010 Incomes : It's All Politics Federal aid provided a record amount of the personal income Americans received in 2010, indicating how widespread the support for such spending is and how difficult politically it will be to reduce such outlays. 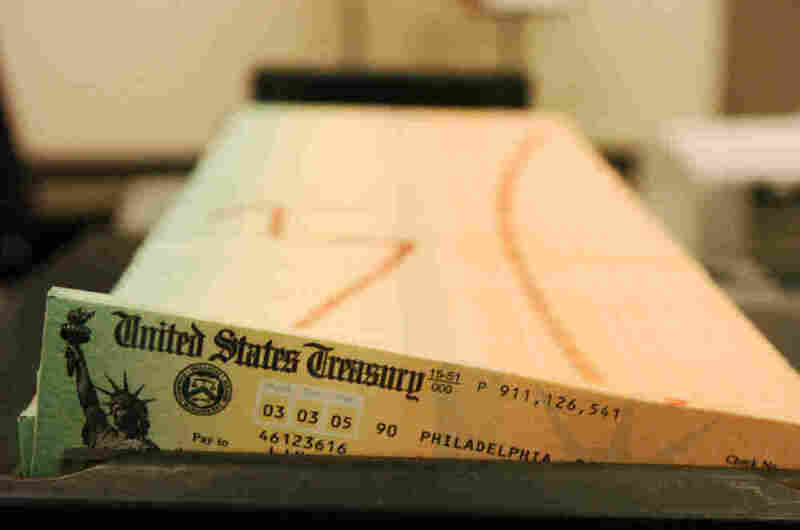 Social Ssecurity checks waiting to be mailed, February 2005. Partly due to job losses caused by the Great Recession, wages made up the lowest share of income since the government started keeping records in 1929, according to USA Today. The aging of the U.S. population was among several factors driving up the percentage of Americans who depend completely or in part on federal help. "What's frightening is the Baby Boomers haven't really started to retire," says University of Michigan economist Donald Grimes of the 77 million people born from 1946 through 1964 whose oldest wave turns 65 this year. "That's when the cost of Medicare will start to explode." This increased dependence suggests how hard it could be politically for federal policymakers to reduce federal spending though some of those outlays will decrease as the economy creates more jobs and the need for unemployment benefits and food stamps declines.